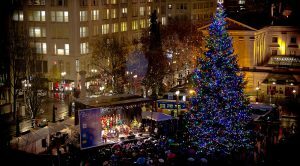 Let TriMet put you in the middle of the holiday magic Friday evening, Nov. 23, at Portland’s 34th Annual Tree Lighting Ceremony. Some 14,000 breath-taking lights will illuminate the 75-foot holiday tree in Pioneer Courthouse Square. The ceremony begins at 5:30 p.m. and is expected to wrap up about 6:30 p.m. All MAX lines and more than 15 bus lines stop within a few blocks of the square. TriMet’s Park & Rides make it easy to connect with trains and buses, so you don’t have to worry about traffic congestion and parking in Downtown Portland. During the closures, trains will stop at the platforms but will not open their doors. Riders should get off the trains one station before or after to reach the square. Also, beginning at 4 p.m., all SW 6th Avenue bus lines (1, 2, 4, 8, 9, 12, 17, 19, 35, 36, 43, 44, 54, 56, 94 and 99), along with CTRAN buses, will not serve stops between SW Salmon and Washington streets. Buses will detour via SW 4th Avenue until about 7 p.m. or until the crowd disperses. Plan ahead and plan an extra 10-15 minutes when riding MAX Friday evening. 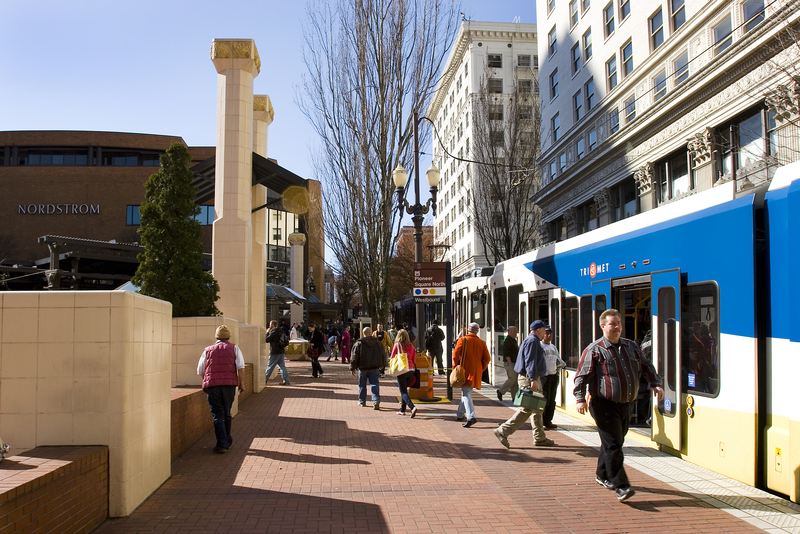 Around 6:15 p.m., as the holiday tree lights up, MAX trains will stop for a time to allow people to safely leave the square. We’ll get the trains rolling and back on schedule as soon as possible. 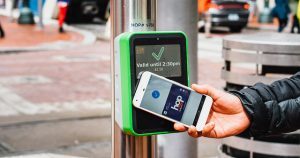 You can pay an Adult fare using your phone equipped with a mobile wallet to tap the green Hop reader on the platform or on board the bus. Pick up a Hop Fastpass® card at one of hundreds of retail outlets and load money on the card before tapping the Hop reader. Buy a virtual Hop card at the Google Play store, load it into Google Pay, and tap a reader to get all the benefits of a plastic Hop card. Just remember to tap every time you board, especially if you’re making transfers, to validate. We want you to have a safe and happy holiday celebration. Awareness only takes a moment. Please stay alert while crossing MAX tracks and streets. Look both ways and make sure an umbrella, hood or other clothing doesn’t block your view of approaching trains, buses and autos.